I'm just hope that FA will prepare the space for Fast8 in the box. But the best way is completely made it Fast1-8 at once. They should prepare the space for Fast9 and Fast10 as well. 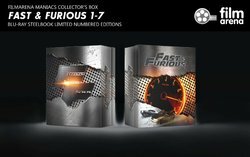 Well seeing that Fast 9 has now been pushed to 2020, why would anybody buy a 1-7 box set now? EXACTLY my first thought when i saw the pictures. Biggest face-palm on FA. Nice concept but didnt think it through. Also, if you're gonna have a subtitle for the first movie called "The Original" shouldn't we have "2 Fast 2 Furious: The Sequel" ? A shame part 8 is missing. Do we have a tentative timeline when the gb could be going live? I’m hoping at least a month before so I can put aside the money for it before it does. Since I still need to get Spider-Man box as well. Was kind of looking forward to these......money saved!! and the artwork is really bad and not even a patch on the MM / Zavvi ones released previously which I am still struggling to sell even at 70. Personally I think these look great! Love the colours and how perfectly they all match. I especially like the collectors box artwork... looking forward to seeing the lenti effect on it. Unfortunately, they're not films I'd want to spend a lot of money on though, so it's a pass for me I'm afraid. @Noodles one thing that they match another is being repetitive..the back art to me is lazy. same just different colors.. I get what you're saying, but there are some slight differences... the background/wavy effects being one of them. But the main difference is the speedometer needle pointing towards the appropriate number for each movie, which is very similar to the idea Universal used for their previous F&F steelbook releases, and people lapped those up (myself included).